Speciality wood products including wide wood slabs, post and beams, specialty wood flooring, custom cabinets, custom made furniture, specialty wood paneling, hard to find wood products, custom millwork, mantels - for residential and commercial use, from contemporary to rustic styling. Located in the midst of one of the most biodiverse areas of the United States, Everhart Lumber Company, LLC, specializes in high quality specialty timber products. 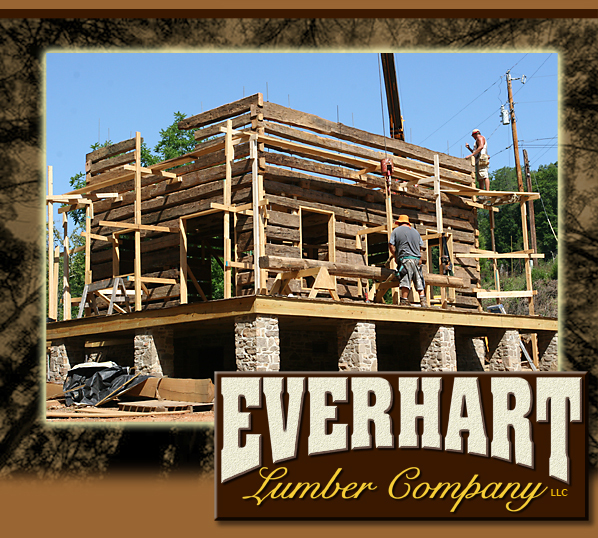 Everhart continues a tradition of more than 100 years as a sawmill and lumber company in Tellico Plains, Tennessee. Our company's on-site mill cuts superior strength Native Hardwoods, as well as Douglas-fir, Western Red Cedar, Southern Yellow Pine and White Pine. Everhart's wood products are highly sought by home owners, building contractors, architects, and house designers. Using locally "rescued" old growth wood, Everhart has created a niche for Extra Wide Wood Slabs, using highly figured wood with proprietary machinery and techniques. Slabs, cut either horizontally or vertically from the huge trees, are carefully selected for their distinctively unique grain, coloring, and textures. These slabs, up to 80" wide and 6" thick, are available as rough sawn lumber as well as sanded, filled and finished slabs. Everhart's own skilled craftsmen are designing and building magnificent furniture and countertops from these slabs, too, with minimal processing in order to unleash the wood's natural beauty. Prefinished Wood Flooring is a another hallmark of Everhart Lumber, using a variety of timber species and the distinctive texture of circle sawn marks, creating an antiqued appearance from new lumber. Unique quarter-sawn oak and circle-sawn Paneling are other specialty wood products offered by Everhart Lumber Company. Post and beams are available in various lengths and sizes; stocked as long as 40 feet and up to 24" square; lengths to 50' are available. Everhart Lumber Company is proud to offer Custom Made Furniture and Cabinetry, from unique character woods and from reclaimed lumber. This handcrafted, heirloom quality wood furniture is built to last generations - and made in the USA. Each piece is designed and built to reflect the customer's desire for something unique and different. The furniture is made by local master furniture makers, with great craftsmanship and attention to detail. From fir, walnut, cedar, pine and other woods, as well as from reclaimed lumber, Everhart's woodcrafters create mantels, dressers, headboards, bars, dining tables, coffee tables, bookcases, armoires, vanities, cabinets, bars, and many other specialty products. Many of the cabinets, furniture, paneling, and flooring lumber products from Everhart are fitting perfectly with the renewed interest in the Arts and Crafts style of architectural. Everhart's skills at Custom Millwork have resolved the hunt for special wood products for many customers, particularly in the field of restoration of rustic buildings. Please visit our online Customer Gallery and our Showroom in Tellico Plains TN to see how our wood an products are being used by our customers and our furniture makers. We also have an Online Store with a rotating inventory of one-of-a-kind solid wood furniture and specialty wood items for sale. "Everhart Lumber Company" Website Design by Lavoie Graphics lavoiegraphics.com.